We look for long- term solutions rather than simply easing your aches and pains for a few days. We need to relate your problem to how you’re working. We check everything using DSE guidelines. You may have a great workstation, with a bells and whistles ergonomic chair, but if you’re not using it properly, then what’s the point? We’ll adjust what we can while we’re there and then write a report on your current set-up, suggesting recommendations on how to get best use of your current facilities, whilst passing on any top tips relating to any other new equipment that could further enhance your situation.  Sitting and leaning forward (typing!) places 150% more pressure on your spinal disks than when standing.  The average person will spend 16 hours a day sitting or standing…. that’s 2/3 of your life!  Ergonomic related injuries include a vast range of musculoskeletal disorders – Tendonitis, Carpal Tunnel Syndrome, Tennis Elbow, Neck and Back injuries.  Adjust seat tilt so Hips are slightly higher than Knees.  Lengthen your Spine to its natural balanced position: bottom against back of the chair, and top back should be supported too.  Elbows should be at right angles, resting on your desk (a slightly sloping work surface should be used when reading & writing).  Screen should be at arm’s length and at 10˚-20˚ below eye level.  Your mouse and phone should be within easy reach. If more than 40% of your day is spent on the phone, use a headset. If you suspect your workstation is a contributing factor to any on-going symptoms: numbing or stiffness in joints or tingling, aching sensations in muscles, then a Work Station Assessment is recommended. 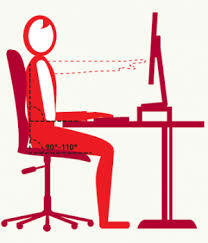 Please call us at 045 874133 and we can discuss your requirements and set up an Ergonomic Assessment. Following the Assessment a written report of findings and recommendations will be provided.